Sausalito Craftworks, Inc., the parent company of Omnirax, was founded in 1974 by Alan Jewett—my incredibly talented original business partner, now retired. We made jewelry—bracelets and earrings. As manufacturers of the finest brass, copper and sterling silver bracelets made in the USA, we fabricated our original designs by hand, using the same care and sophisticated techniques most often associated with the finest precious metal jewelry. We made our bracelets in sizes, and they were adjustable. Our tagline was, “Everybody gets “˜the perfect fit'”—and they did. We were quite the phenomenon. We started selling on “the streets of San Francisco,” and soon we were selling to over 500 wholesale accounts—fine gift shops, galleries and boutiques—and exhibiting at more juried Arts & Crafts shows nationwide than anyone in the country. In 1985 Alan, who is also a musician, bought his first electronic synthesizers from our local music store, Bananas at Large. He needed a place to put them—he needed a studio rack. Unbelievably, there was no such thing. 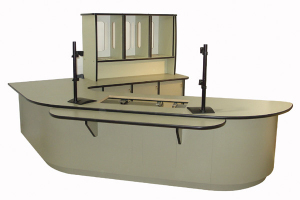 At that time, David Holland—my “brother from another mother,” my current business partner and our Designer—was running our little woodshop where we made point-of-purchase countertop displays for our jewelry. 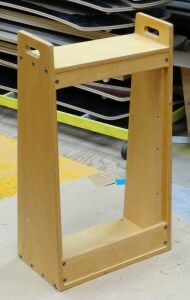 Alan designed a 12-space slant rack made out of maple plywood. David built two of them. Alan took one home to his studio and we drove the other one up to Bananas. They sold theirs that weekend. BOOM! We were in the Music Business. Omnirax was born. 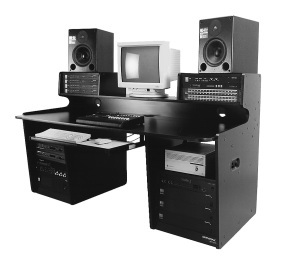 Our first application-specific piece of furniture was the CW30, designed around the Alesis 1622 rack-mount mixer. We attached a desk to the CW30 to hold a keyboard controller and added a riser with 12 rack spaces to hold “slave” synths, effects devices, etc. 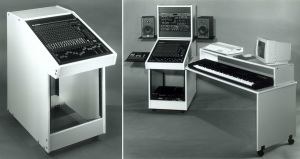 Now we were a modular system. We decided to exhibit at NAMM—the National Association of Music Merchants trade show in Anaheim. When jazz legend Herbie Hancock stopped at our booth, looked around and said, “Omnirax is cool,” and then bought an Oak CW30 for his home studio, we knew we were on the right track. 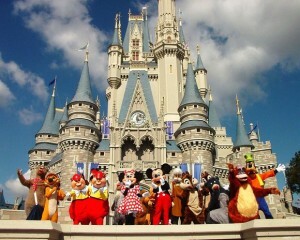 It was the beginning of a beautiful and lasting friendship. Herbie is the first member of the Omnirax Hall of Fame. 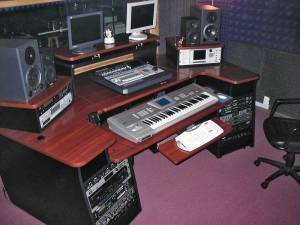 We worked closely with him to identify his particular Studio Furniture needs and to design his ideal keyboard composing workstation. We modified some existing Omnirax models which we integrated with other fully customized designs to provide Herbie with a thoroughly personalized creative environment. We realized then that “application specific” isn’t always enough. Omnirax Custom and “Semi-Custom” had arrived. 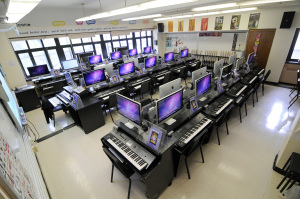 Omnirax created and defined the “category” of music Studio Furniture. 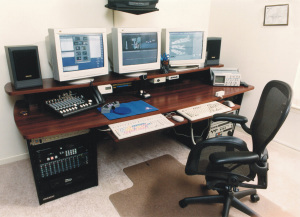 In 1990 we heard that Digidesign was developing Pro Tools—a revolutionary state-of-the-art digital audio platform for recording and editing in music production, film scoring and film and television post production. We called them up, drove down to Menlo Park and said to the product manager, “Imagine your ideal workstation environment for a Pro Tools user, and we’ll design it and build it for you.” As a result of that collaboration, we developed the ProStation (check out that monitor), our first Audio/Video workstation desk. It put us on the map. Over the next several years we expanded our markets, designing and building Custom solutions and turning them into saleable products for music production, video editing and communications. 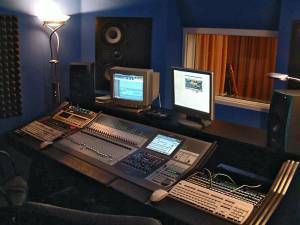 The music industry was on fire with overnight technological advances as analog went digital. 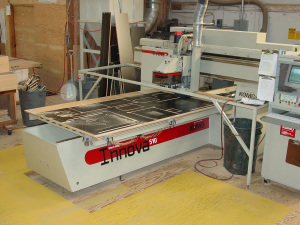 In 1998 we purchased our CNC router. Now, we could cut curves, softening the hard edges of rectangular desktops, humanizing technology and beginning to develop our signature look. Around that time we partnered with Soundtree, the Music Education Division of Korg USA, furnishing Music Education classrooms. K-12, universities and even entire school districts. We still furnish a lot of classrooms—they look like this. We were doing “ergonomics” in the music industry before anyone else used the word. In Music Production, composers want everything—piano keyboard, computer keyboard, mouse, mixer, speakers, adjustable modules—all right in front of them within easy reach. In 2001, we designed the F2 which was nominated for the prestigious TEC Award for Outstanding Technical Achievement. Furniture for Technical Achievement? Unheard of! We were cruising. Selling through dealers—independents as well as the big chains who were placing large monthly stocking orders while we referred customers to them. Then the business paradigm shifted. The music industry had flattened out and dealers wouldn’t stock anymore. We had to adjust. At that time you either sold through dealers or you sold direct—no one did both. We changed that. As far as we know, we were the first manufacturer in the music business to sell both to dealers and directly to end users. We were able to accomplish this because we acted with integrity and treated everyone fairly. It’s common-practice now. 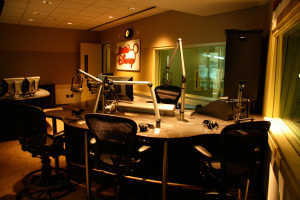 In 2003, we were sitting around, minding our own business, when we got a call from the manager of one of our music dealers saying, “I’m here with John Buckham, the Chief Engineer for Entravision Communications—they’re moving their flagship station from San Jose to LA and he needs 27 rooms of Radio Furniture. He’s checked out all the usual furniture suspects and he can’t find what he wants. I said, “˜Did you call Omnirax—they can do anything.’ And he said, “˜Omnirax? I have an Omnirax in my home studio. I didn’t know they made Radio Furniture. '” This was a whole other ballgame: their design, 27 rooms, $250,000—a lot of money for us at that time—and an unfamiliar market. But to quote Will Rogers, “Why not go out on a limb? That’s where the fruit is.” And BOOM! We were in the Radio business. John believed we could do it. John is a member of the Omnirax Hall of Fame. So, we said goodbye to the NAMM show and our annual visit to Disneyland, and took a booth at NAB—the National Association of Broadcasters Trade Show in Las Vegas. We took out bold full page ads in the radio magazines, saying something like: “We’re Omnirax. We changed the music business and now we’re here to change the radio business, so you better come and visit our booth.” And they came. One of the people who came was Phil Lerza, Chief Engineer for KFRC in San Francisco and another member of the Omnirax Hall of Fame. He was re-doing 12 rooms. He said, “You really want this job. 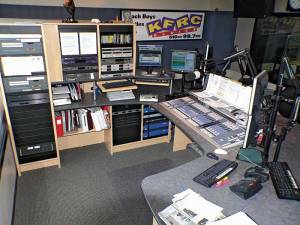 I don’t have a big budget, so you won’t make a lot of money, but I’ll teach you everything you need to know about Radio.” And he did. 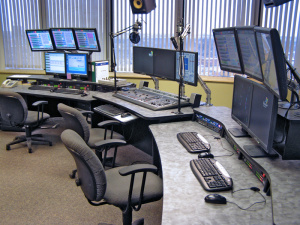 Collaborating on that job, we developed our Broadcast Furniture signature look—our Innova Line of Custom Radio Furniture. 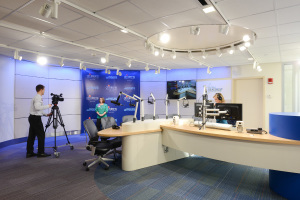 This led to both the 5 station Clear Channel consolidation in lower Manhattan (which included 10 On-Air studios with Corian countertops, the first time we worked in solid surface), and a complete re-build of WNYC public radio. 70 rooms simultaneously from 3000 miles away! That was huge. 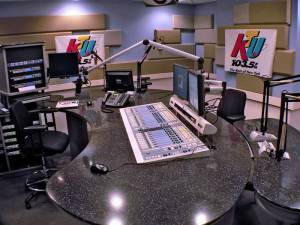 It put us on the Radio map. As we’re fond of saying, “Trust us with your next project, and become a Customer for Life.” It’s true. In 2009 the economy stalled. The Music Industry contracted, education dollars were pretty much non-existent, consumers and businesses adopted a wait and see attitude and the big Media Corporations put all major projects on hold. That put us in a jam. We’ve got the best crew in the world. On average they’ve been with us for at least 12-15 years. When we hired them they were kids, now they have families and mortgages. We feel responsible for them. We’ve always believed that the smartest thing we can do is to hire the “right” people and keep them. We didn’t need them—then. There was no way to afford them—then. We were advised to let some of them go. But, we knew then we’d need them all now. So, we made the decision to keep them all. We just had no idea THEN, how far down the road NOW would be. We embraced the challenge. It took everything we had—if nothing else, we are resourceful. We kept our Team intact! In the midst of all that, in 2011, we were getting a little “antsy” sitting around waiting for the phone not to ring. We needed to be proactive. 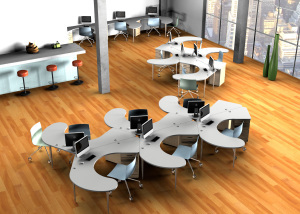 So, we joined BNI, a Referral Marketing organization, with the idea of developing a new line of office furniture. Witness the power of Referral Marketing: The physical therapist introduced me to an ergonomic consultant. I just followed the affinity. Meanwhile, the payroll processer introduced me to his sailing buddy, a custom chair manufacturer, who gave me his top of the line chair to display in our working showroom. I didn’t feel right about being the only one in the office with such a good chair, so I asked David and Sara—my right hand—to go the Chair Place in San Francisco and sit in chairs until they found one that felt right. And then we’d call the manufacturer and make a deal. And that chair manufacturer introduced me to an award-winning office furniture designer. 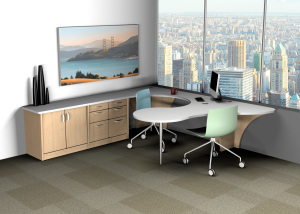 I fell in love with the design—the curvilinear shapes and clean lines—and its Unique Selling Proposition: “fits more people, more connected in less space.” In November, 2012 we licensed that furniture design and BOOM! 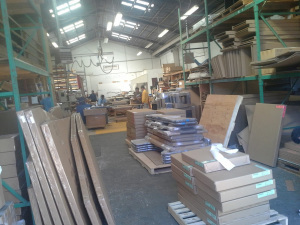 We were in the Office Furniture business. This is the third market—first Music, then Broadcast and now Office—that we’ve entered without prior experience as to how that market works. No problem. We’re gaining that experience now. And the way we see it, when not bound by convention, anything is possible. As the new kid on the block, that’s proven true twice before. Looking back, our journey has been a curious blend of innocence, dumbass moments, perseverance and serendipity. Looking forward, the economy has revived. 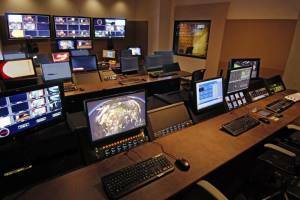 The Technical Furniture and Broadcast Furniture markets are strong. We’re busy again. And the visionaries and early adopters in the Office Furniture market are ready for something new and exciting. 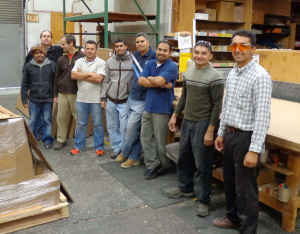 These four decades of experience, infused with re-vitalized energy, is who the Omnirax Furniture Company is today. When opportunity knocks, answer the door. Never give up. And keep having fun. This is Our Story—and I’m sticking to it.